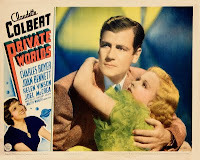 Such is the case with the 1935 film Private Worlds, starring Claudette Colbert, Charles Boyer, Joel McCrea, and Joan Bennett. With such a cast it is easy to understand why Private Worlds would be in demand — even more so for a devotee of the Academy Awards like me: Claudette Colbert earned a Best Actress nomination for her work in the film. Many of these 700 films were shown regularly by American Movie Classics back in its heyday, when host Bob Dorian offered the Pepsi to Robert Osbourne’s Coca-Cola across the dial at Turner Classic Movies. And although AMC, thanks to Mad Men and other original television programs, has redeemed itself in the eyes of many, it still stings that their rather broad idea of an “American Movie Classic” starts and stops with pictures like Steven Seagal’s Marked for Death. Those of you with a long memory may recall that in the wake of their format change, AMC attempted to spin out a new network, AMC’s Hollywood Classics, that would have maintained their original format, but the channel never materialized. Maybe such a venture is once again possible? I don’t know the ins and outs of cable television, but it’s surprising to me given the phenomenal success of TCM, that there isn’t room for AMC to somehow return to its roots and rebroadcast their vintage film library. Certainly with the ever-growing number of super-specialized networks doing business today there has to be room for another classic film outlet. If nothing else, why not cut a streaming deal with Netflix? Until then, anyone in search of such a film has to do just that: search. Doing so led me to purchase a bootleg copy of Private Worlds from the web, as I have often done in the past. The quality is universally poor, and the running time are almost always a minute or two shy of what’s listed on IMDb — but the films are watchable and, at least, available. 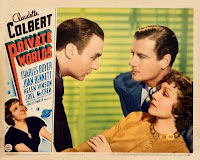 Without actually seeing the film it would be easy to dismiss Private Worlds as merely a romantic melodrama set in a mental hospital (the poster certainly suggests as much), but there is much more happening in the movie to make it worth seeking out. Here’s the story in a nutshell: Claudette Colbert plays Dr. Jane Everest, a psychiatrist in charge of the male ward at The Brentwood clinic, a progressive mental hospital. Her partner is Dr. Alex MacGregor (Joel McCrea), with whom she has partnered for many years. Despite their professional relationship the pair are not involved romantically — MacGregor is already married to Sally (Joan Bennett), an innocent and trusting girl who adores Jane and trusts Alex — until he gives here reason not to, while Jane pines for a love lost during the first world war. Things begin to go awry when a new hospital superintendant is appointed: Dr. Monet (Charles Boyer) who arrives with his sister Claire (Helen Vinson) in tow and begins to shake things up at the hospital. Monet believes there is no place for a woman in the upper echelons of the medical profession, and banishes Jane to the outpatient clinic. Claire is attracted to Alex, and easily pulls him in her direction, while Sally gradually becomes unglued. The consequences of Alex’s transgressions with Claire are the source of much of the film’s dramatic tension, and the final few reels are concerned with all of these entanglements sorting themselves out, with Colbert’s Jane the driving force behind everything. Gregory La Cava, who did most of his directorial work during the silent era (though he helmed such well remembered movies as My Man Godfrey and Stage Door, among others), does a fine job with this material. One scene in particular stands out and demonstrates how tight the narrative of the film is: early on we are introduced to two of Brentwood’s patients, a muscular man named Jerry who likes to see everything that is happening on the ward, and an dying, bed-ridden old man who murmurs constantly to himself in an unknown language. Late one night, shortly after joining the staff, Dr. Monet is called to the ward, where he looks in on the old man. He tells the nurse that the man is speaking Arabic and merely wants someone to pray for him. Dr. Monet grants the request, but not before placing screens around the gurney in an effort to spare the dying man’s dignity. This infuriates Jerry, who springs from his bed and attacks Monet, seconds after the old man finally succumbs. Jane, just entering the scene, shouts a warning just as Jerry attacks the doctor. The two men struggle while the other patients shout encouragement. La Cava’s camera pans in both directions and zooms in and out on the leering faces of the disturbed patients, as the soundtrack becomes a cacophony of screams and cackles. Combined with the near pitch-black setting the scene takes on an expressionistic feel very much out of character with other domestic films of the time. It’s a visually striking scene that reinforces the notion that Colbert’s Everest understands and manages the patients on the ward to a greater extent than her male counterparts, yet also softens the viewer’s impression of Boyer’s Monet. It culminates a few subtle instances of earlier foreshadowing and punctuates the middle of the film. Admittedly, as much as I liked Private Worlds, it has its share of flaws. In general, it sells out too much to melodrama in its second half, but given the period and the mood of depression-era audiences it is difficult to hold it against the film. We are asked to accept American actress Helen Vinson as Charles Boyer’s sister, yet are given no explanations as to their vastly different accents. Colbert’s Jane Everest is a little too perfect as well. Self-sacrificing, medically infallible, even angelic at times (if it helps, it’s very easy to imagine Loretta Young in this part), it would have been nice if Colbert had been allowed to be a little more human here — again understandable given the movie’s goal of showing that a female doctor could hold her own, even thrive, in a male-dominated profession. Nonetheless this is a sparkling mid-thirties film that deserves to be seen again. Sounds fascinating. Intriguing review. I don't know what the chances are that I'll ever see it, but I'll be on the look-out. Hi Mark, What a good review of a film that too few people have had a chance to see. While I thought that this was one of the few times when Joel McCrea seemed in over his head in a role, I was particularly impressed by Joan Bennett's psychological implosion in one scene, when she realizes that her own presence in the hospital milieu is superfluous. While Boyer's preoccupation with his sister's troubles received too little attention, I found the "antiseptic" Colbert (nice description by you, Mark) and detached Boyer to be highly unlikely halves of a couple, though it probably was inevitable given the period. After years of being fascinated by The Mortal Storm (1940), I finally read the book which was fascinating. I have found a few of the 33 books written by Phyllis Bottome through my library and learned that her understanding of the emerging psychiatric field was rooted in her training in psychoanalysis that she received from Alfred Adler in Vienna. Btw, I've recently discovered that there is now a biography available of this interesting author, called "The Constant Liberal: Phyllis Bottome" by Pam Hirsch. Thanks Moira - I really appreciate the additional background information, especially about Bottome. I agree with you about Bennett, this seems to be the movie where she finally got the chance to act a little, and she makes good. She's forever a brunette at Where Danger Lives, and a blonde here - I'm learning to appreciate "both" of her! Yeah! What a difference when Joan went chestnut--I just saw the film Trade Winds (1938) for the first time recently in which Bennett went from light to dark-haired. She needed the dark hair to play those noir dames, though she could still play the innocent, as she did so well in Man Hunt (1941), the first and my favorite Joan Bennett-Fritz Lang collaboration. I'm so glad that you have expanded your blogging "empire" and I have been enjoying your posts. Ha! Empire - I like that word! I always enjoy when summer rolls around and I am able to dedicate more time to this blog. I only get 5% of the traffic here that I get over at the other place - but sheesh, people really love the crime pictures. I'm beginning to mull over a broader poster countdown, possibly encompassing all classics from the talkies through 1960 or 1965, but it takes a tremendous amount of work to put something like that together. I can feel the idea tugging at me each day though.... Thanks, as ever, for reading; II really enjoy your insightful comments. Just a note to say how much I enjoyed your post. That infamous IMDb note definitely causes groans when seen...Like you I have turned to the "grey market" in desperation to see some of the titles I most want to see. I'd be more than happy to pay full price if someone would just make them available! As I've complained on my blog, it hardly seems right, decades after the films were made, to make it so very difficult for the public to see an important chunk of cinema histoyr. Back to the movie, this has some of my favorites and sounds very interesting and unusual. I had no idea what it was about and appreciate you filling me in! I'll look forward to seeing it at some point in the future. I've always had a fondness for "blond" Bennett because of LITTLE WOMEN, but am really loving gradually becoming more familiar with her brunette years! Like Moira I just saw TRADE WINDS for the first time recently, which was great fun. Your noir poster series was amazing and quite educational -- would love anything else you do along those lines!